Sure enough these Kit Kats deliver on the chocolate front. While maybe it’s not as fancy a dark chocolate as you might get from say, Scharffen Berger, it was probably the best dark chocolate I’ve had from a mass produced brand. I spotted these bars over the weekend at the Park Slope Key Food on 5th Avenue—for whatever reason they have a lovely UK imports section—for $1.29, which isn’t a terrible price for an import bar. 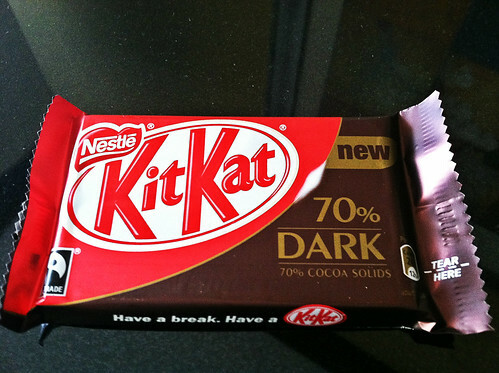 I’d be curious to see how they compare in a side-by-side with the Dark Kit Kat bar that’s typically sold in the States. Anyone ever tried a head-to-head with the two?